New Delhi: The Congress-led United Progressive Alliance, or UPA, has again been blindsided, with the Dravida Munnetra Kazhagam (DMK) representative in the Union cabinet, T.R. Baalu, failing to inform either the Union cabinet or the coordinator for the legal defence of the government in the controversial Sethusamudram project, prior to filing a crucial affidavit in the Supreme Court. The submission, among other things, states that the Ram Sethu was destroyed by Ram himself, and that it was not proved by the petitioners that the structure was integral to Hinduism. 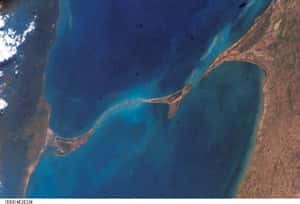 Controversial topic: A Nasa photo of the Ram Sethu. Many Hindus believe the god-king, Ram, built this bridge to rescue his wife, Sita, from the clutches of demon-king Ravana. Others say it is a coral walkway. The filing, while in line with the DMK’s own position on the issue, could quickly emerge as a political problem for the Congress party, which is already being subjected to the charge that it is soft on minorities at the expense of India’s Hindu majority. The Sethusamudram project began in 2004 and proposed to create a shipping channel by dredging a walkway connecting India and Sri Lanka. Many Hindus believe the god-king, Ram, built this bridge with an army of monkeys to rescue his wife, Sita, from the clutches of demon-king Ravana. Others say it is a coral walkway. A senior minister in the UPA government, who was tasked with coordinating the legal challenge on the channel project but didn’t want to be named, concedes: “I do not know how or why that submission was filed before the court. I am yet to see the document. This was not discussed during cabinet meetings either." When the case proceedings ended on 30 July, the court, while reserving judgment, had asked the parties to submit written arguments, including new contentions. The written document submitted by the government on 14 October is dubbed a “Brief written Note by Counsel for the Union of India submitted after the close of oral arguments on 30 July 2008". It has excerpts from religious texts including the Kamba Ramayanam and Padma Purana. The document states that “it has not been proved (by the petitioners) undoubtedly to the belief of the Hindu community—that Lord did not himself break the bridge". Quoting the religious texts, it argued that the “petitioners have not alleged much less proved that Rama Sethu forms an integral part of the Hindu religion". Moreover, it describes the petitions as “politically motivated" and goes on to say that the pleas of the petitioners smack of “a lack of bona fide". An officer in the culture ministry, who is in charge of the department that deals with the channel project, also said they weren’t consulted nor were they informed after the submission by the shipping and road transport ministry. “I read about the submission in the next day’s papers. We were not informed," said this officer who, too, didn’t want to be named. Another senior official, who is in the shipping and road transport ministry and similarly didn’t want his name used, said “the minister has been directly dealing with the matter himself", indicating that even relevant ministry officials were not briefed about the filing of the submission. Calls to Baalu’s office weren’t returned. Fali S. Nariman, the government counsel on the case, too, was unavailable for comment. Additional solicitor general R. Mohan, who was handling the shipping ministry’s brief, declined to comment. Commentator Cho Ramaswamy says Baalu and Tamil Nadu chief minister M. Karunandhi’s family are very keen on the Sethusamudram project proceeding. “However, this (the Sethusamudram controversy) is not an issue that will benefit any political party when it comes to the elections," he added. DMK spokesperson Ilangovan, who uses only one name, said: “We will invoke Sethusamudram during the polls to highlight how the BJP has deprived the benefits of such a good project to Tamil Nadu." He refused to comment further. On his part, Arun Kumar, a Congress party secretary who is in charge of the Tamil Nadu unit, said he will study the affidavit in detail before reacting to it. BJP spokesman Prakash Javadekar said: “The government is not only indulging in interpreting religion but is also giving a new twist to Ram katha itself. In the first affidavit, the government said there is no proof of Ram’s existence. Then there was widespread anger and it withdrew the affidavit. In the next one, it said it was a matter of faith and was up to the court to decide. Now they are saying that Ram himself destroyed the Ram Sethu, which means they are admitting that Ram existed." The government on 30 July told the court it would set up a committee headed by R.K. Pachauri, director general of The Energy and Resourses Institute, to look at an alternative route for the project, one that possibly doesn’t cut across the Ram Sethu. The committee was meant to examine alternative routes and submit a report before the court. The report is yet to be submitted. Janata Party president Subramanian Swamy, the chief petitioner in the case related to the Sethusamudram project, moved the Supreme Court on Thursday challenging the submissions made by the Centre. The court has permitted him to file submissions to rebut the Centre’s new arguments. “The Centre has made some new points almost two and a half months after the court reserved its judgement," said Swamy. “It is quite clear that the written submissions were filed primarily to intimidate and influence the Pachauri committee which consists of government officials." Krisnamurthy Ramasubbu and Liz Mathew contributed to this story.